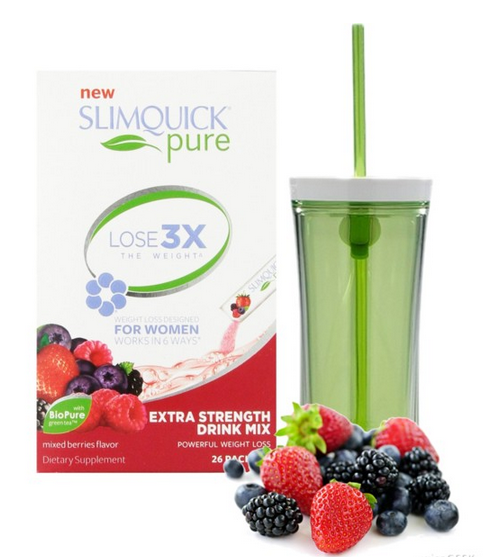 SLIMQUICK Pure Extra Strength Mixed Berries Drink Mix is designed for women to help them lose 3 times the weight by addressing the 6 physical reasons women have trouble losing weight. It works to increase metabolism, reduce appetite, boost energy, reduce excess water, support hormones, and reduce stress. Plus, the little drink mix packet contains antioxidants, calcium, vitamin D, and BioPure Green Tea – with zero calories. BioPure Green Tea™ has been shown in a published clinical study to help overweight women lose 3 times the weight versus dieting alone, in just 13 weeks. Just tear open, pour into your water bottle or glass, and then shake/stir your way to a tasty metabolism boost. Here's the thing: I like the vanilla protein powder. But I love this drink mix. I spent a lot of time in the office and it's all too easy to hit up the vending machine for a sugary pop, bottled ice coffee, or (gasp!) energy drink when I'm hitting the mid-day slump. I try to drink more water, I do. But especially at the office, I could use a flavor perk-me-up. I was a little dubious. I've tried a lot of other powder drink mixes that promised delicious-ness and energy, only to be disappointed by it being too sweet, too clumpy, or too chalky. This drink mix is sooooo tasty. It's not too sweet and reminds me of some kind of berry drink I had as a little girl... though I can't remember exactly what it was! It does contain caffeine, which helps boost metabolism and gives energy for workouts. (Which is exactly what I need around 2pm every day! Haha.) For me, the drink mix provides a refreshing, tasty boost of steady energy and just enough caffeine to feel alert and focused – nothing jittery like you'd get from an energy drink. So far, I've been hooked on dumping this powder into my water cup in the morning and in the afternoon. Though I'm really interested in trying some of these creative recipes that incorporate the drink mix into "slimming summer sippers." I've been so busy with work and weekend events (a bachelorette party, bridal shower, wedding, and road-trip to a little Irish Fest) that I've made sure to keep a couple of these packets in my purse for a go-to refresher. But I'll admit, I've been too busy to actually weigh in on the scale. And honestly, thanks to the wedding and Irish Fest, I haven't been eating all that healthy on weekends. But when I drink this, I feel good. I feel like I'm making one less bad choice. I'm reaching for one less coffee or energy drink to get through the day. And that's a victory, right? Want to try SLIMQUICK Pure Extra Strength Mixed Berries Drink Mix for yourself? I've got you covered. Here's a coupon to save $5. It's good now through August 31, so click, print, and go grab a box! It looks tasty and healthy. I am using milkshake from this firm http://weightlosstop.com/pills/slimquick_review.php and it's great. I think their mix berries drink should be fine too.